WASHINGTON — The White House signaled on Tuesday that President Trump might be ready to capitulate on his demand for $5 billion for a wall on the southwestern border, but negotiations on a spending deal remained stalled as lawmakers awaited a White House strategy to avert a Christmastime government shutdown. 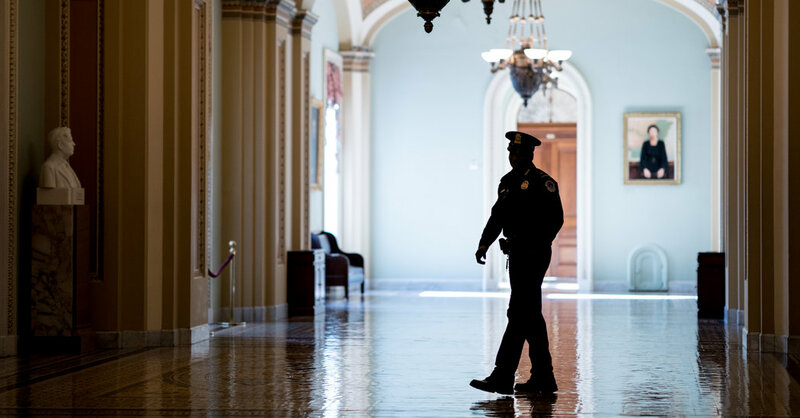 Days before midnight Friday, when funding for large parts of the government will lapse, Mr. Trump’s flirtation with a retreat on his wall only underscored the dysfunction at the tail end of the all-Republican majority on Capitol Hill. The White House blamed the Republican-controlled Senate for failing to pass legislation to bridge the divide, while Republican leaders said they were still unsure what the president was willing to sign. “We are disappointed in the fact that they have yet to vote on something or pass something,” Sarah Huckabee Sanders, the White House press secretary, told reporters. Minutes later, Senator Mitch McConnell of Kentucky, the majority leader, told reporters at the Capitol that he was still trying to determine what Mr. Trump would accept. Republicans worked to create a package that would allow Mr. Trump to declare victory in retreat, but they came up empty, unable to forge a plan that would satisfy a president intent on fulfilling a signature campaign promise and Democrats emboldened by an impending takeover of the House. Instead, senators and senior congressional aides in both parties said an agreement was close at hand to essentially push the government spending fight into the new year, when Democrats will assume control of the House and Mr. Trump’s negotiating leverage — already on the wane — will be considerably weakened. “I think it’s not a very desirable outcome,” he said. But Senator Chuck Schumer of New York, the Democratic leader, said his party would be open to the idea. “We’d certainly very seriously look at it,” he told reporters. After days of eerie quiet with a partial shutdown looming, the burst of activity suggested that all sides might be preparing for a brief holiday reprieve from their stalemate. Ms. Sanders offered the first glimmers of a way out of the impasse in an interview Tuesday morning on Fox News, in which she said Mr. Trump — who only a week ago said he would be proud to force a shutdown over wall funding — did not want to see government funding lapse. She said the president was open to spending options short of the $5 billion lump sum he has demanded, and would find “different funding sources” to finance the wall. “The president has asked every agency to look and see if they have money that could be used for that purpose,” she told reporters later. Still, that would require approval from Congress, which Democrats said they would not grant. Mr. McConnell had suggested a plan that would have provided $1.6 billion for border security but prohibited spending it on a wall, while allowing Mr. Trump to spend as much as $1 billion in unspent funds from other agencies on his immigration priorities. Mr. Schumer and Representative Nancy Pelosi of California, the presumptive incoming speaker, quickly rejected it. “Leader Schumer and I have said that we cannot accept the offer they made of a billion-dollar slush fund for the president to implement his very wrong immigration policies, so that won’t happen,” Ms. Pelosi told reporters. Mr. Schumer noted that Democrats had already proposed two ways of extending funding for the Department of Homeland Security without spending for the wall, and that Mr. Trump had yet to offer an alternative and appeared to be out of options. A week ago, Mr. Trump publicly confronted Mr. Schumer and Ms. Pelosi in a televised Oval Office meeting where he vowed to shut down the government if Democrats refused to allocate money for the wall and suggested a shutdown over his demand was to his political advantage. The scene robbed congressional Republicans of their ability to blame a potential impasse on Democrats, and they have spent the days since casting about for ways to choreograph a compromise that would protect Mr. Trump’s ego and still be broadly acceptable. Ms. Sanders appeared to embrace one such possibility on Tuesday, when she said the White House might accept the $1.6 billion proposal. B ut it was unclear if Mr. Trump would follow suit, particularly after Democrats ruled out allowing him to spend additional money from other accounts on the border wall. Senator Jon Tester of Montana, the top Democrat on the committee that negotiated the spending bill for the Department of Homeland Security, rebuffed Ms. Sanders’s claim that other funds could be used to reach the $5 billion mark. “If you’ve got that kind of cushion in your budget and you don’t need that money, use it to pay down the debt,” he said. Senator Richard C. Shelby of Alabama, the chairman of the Senate Appropriations Committee, said the delicate negotiations were continuing. “We’ve got a lot of parties involved, and we’ve got to thread the needle,” Mr. Shelby said.